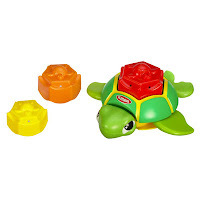 The TUBBY TURTLE toy is a special bath-time pal who makes a "splash" with flippers that move, and three stacking shapes that nest! Your little one can scoop water with the chunky shapes and practice hand-eye coordination with this adorable floating friend! Pull the turtle's tail and it "swims"! The stack-and-nest shapes fit on the turtle's belly and back! 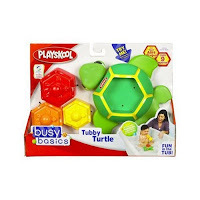 Have plenty of fun with the TUBBY TURTLE toy both in and out of the water! " Floating tub toy "swims" and comes with three stack-and-nest shapes for pour-and-strain water play." A special pal -- in or out of the tub!"